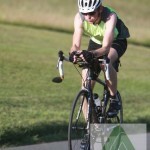 43m24s (23rd; 1st 36:26, 288 finishers) [Breakdown: 9:32, 1:00 T1, 21:23, 0:54 T2, 10:39]. I did not do any duathlon specific training since the previous duathlon at the start of June, instead I trained for the Ring of Kerry charity cycle. 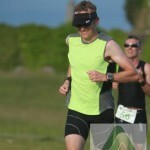 I hoped that the 2 training runs for the Irish Runner 5 mile would help my run performance. I turned up to see a long queue for the pre-registered athletes. Thankfully the organisers created a new queue for those in the first race. I met Marie who had entered the second race. I flew out of on the first run and only slowed down a little and completed it only 9 seconds slower than the run in my duathlon PB last year. My heart was racing by the end of the run. It took a while on the bike to bring my running heart rate down. 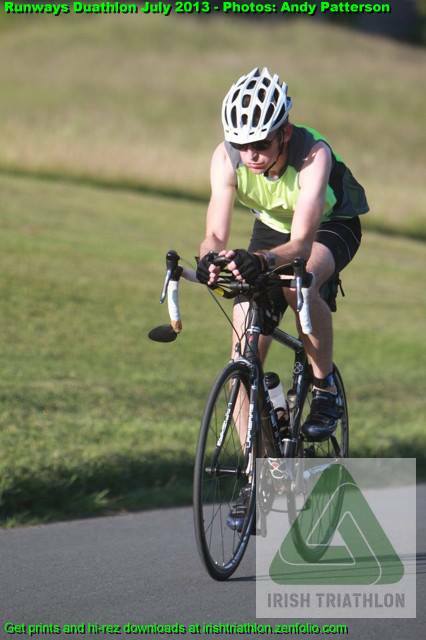 The cycle went well despite the head wind on the back end of the course. I maintained a good speed through the S bends – for some unknown reason I had confidence in the corners. On one I saw that I was doing 23mph in the corner. Only a few people passed me on the cycle. I began the second run just planning to keep my position. 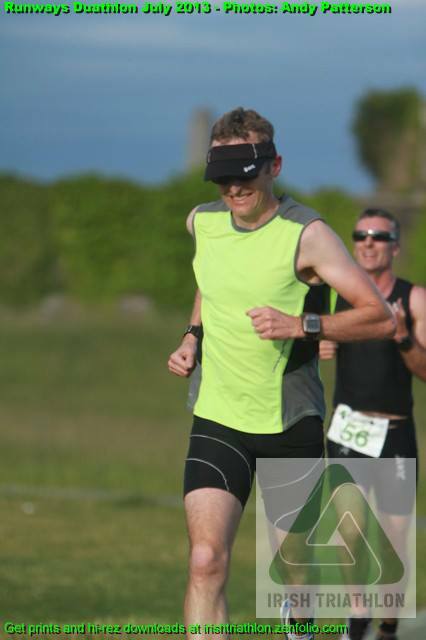 After about 500m I managed to pass two people, using the arm pumping technique that helped me up the Irish Runner 5 mile the previous weekend. About 2/3 the way around I passed the female winner, Aoife Lynch, who had a very slow second run (12m18s vs 10m32s in June). While the time was well off a PB, I was happy with how I pushed it on both runs.